An allele is specific variation of a gene. Bacteria, because they have a single ring of DNA, have one allele per gene per organism. In sexually reproducing organisms, each parent gives an allele for each gene, giving the offspring two alleles per gene. Because alleles are just variants of specific genes, different alleles are found on the same locations on the chromosomes of different individuals. This is important because it gives organisms to be incredibly varied in the functions of their various alleles, while at the same time being able to reproduce. This create variety caused by mutations in specific genes gives rise to a wide number of alleles for any trait in a given population. Some areas of the genome are more protected against mutation than other areas. For instance, the ends of chromosomes are often broken and changed chemically because of the interactions with the surrounding cytosol and membranes it may come into contact with. This breakage or damage necessitates DNA repair. While the enzymes that repair DNA are extremely efficient, they sometimes make mistakes. 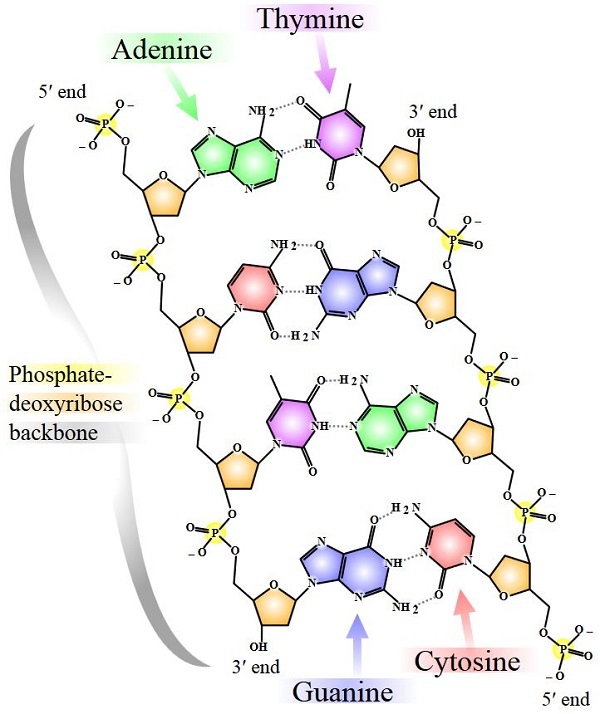 The repair of DNA molecules is carried out by a variety of enzymes, one of the most important of which is DNA polymerase. DNA polymerase uses free floating nucleic acid bases to “rebuild” the DNA, one nucleic acid at a time. After the DNA is unwound by another enzyme, helicase, DNA polymerase goes to work on each strand of the two-stranded DNA molecule. By “reading” one strand and adding nucleic acid bases together, it creates a brand new strand that can couple to the first strand. DNA bases have counterparts that always go together. Guanine (G) is the base pair of cytosine (C). Thymine (T) is always the base pair of adenine (A). Sometimes, the polymerase makes a mistake, and the wrong base pairs are put together. Other enzymes are designed to “check” the DNA after it has been synthesized to find these errors. The enzyme runs along the DNA, checking for bumps that signify two base pairs are not properly bonded. If all these mechanisms fail to catch the mutation, it will be replicated the next time the cell divides. In bacteria this can give rise to whole colonies that have novel mutations and can be easily studied. In sexually reproducing organisms, a beneficial mutation is only valuable if it happens early in development or in the production of gametes. A mutation in a single skin cell, for instance, will not be able to help the organism in a large way. The cell may give rise to a few thousand “good” skin cells, but compared to the trillions on your body, they wouldn’t matter. In early development, or in the production of gametes however, the mutations of a gene into different alleles can be passed onto entire organisms, which can then reproduce the allele to its full benefit. Other mutations, known as deleterious mutations, cause a disruption of cellular function. These mutations cause non-functional alleles to arise, as is the case in cancers. Some cancers are caused by mutations in tumor-suppressing genes, which regulate the size, shape, and growth of individual cells. A non-functional allele at this gene means the cell will continue to grow and divide, regardless of the signals it receives. As part of a functioning body of trillions of cells, this can cause a terrible amount of damage if the cancerous cells are in a sensitive or vital area. The founder of the field of genetics, Gregor Mendel, was a friar who studied peas. One of the traits that he studied was flower color. Mendel’s peas produced two different colors of flower, purple and white. Although he did not know it at the time, these two colors represented the interactions of different alleles in the genomes of the plants. Plants are sexually reproducing, meaning they receive two alleles for each trait. The trait for flower color is determined by a gene that creates an enzyme responsible for creating the pigment we see as purple. Plants that received even one functioning allele produce purple flowers, while plants that receive two non-functioning alleles produce white flowers. Because one functioning allele can completely mask the effects of the non-functioning allele, the former is said to be the dominant allele, while the non-functioning allele is the recessive. 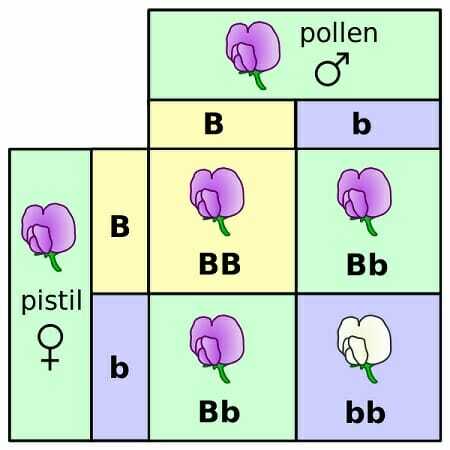 The interactions between these alleles produces important variability in the flowers. While the recessive allele can be masked by the dominant allele, it does not mean that the dominant allele is better for the plant. It could be true that white flowers attract more pollinators, and are therefore more successful at reproducing. If this were true, the allele frequency of the non-functioning allele would increase in the population, even though it is not functioning. Sometimes the most adaptable function of an enzyme is to not have the enzyme functioning at all. One of the things that most interested Mendel was the enormous variety he could obtain by crossing two seemingly identical plants. Below is a table of the various traits Mendel observed. He observed that while each of these traits only had two forms, the different alleles could be mix-matched in an enormous variety of patterns and shapes. What Mendel was beginning to describe were the laws of segregation and independent assortment. The laws of segregation and independent assortment deal with the way cells divide their DNA to prepare haploid cells as sperm and egg. Although both alleles for a given trait start in the same diploid cell, they will be separated into separate eggs or sperm by the end of meiosis. This, the law of segregation, means that while a recessive allele can be masked in the expression of an organism, it has the same chance of being passed on to the offspring as a dominant allele. Also important is the law of independent assortment, which says that the alleles from the same gene will be sorted independently of alleles from other genes. This is important because it gives rise to the enormous complexity of life. From the same pea plant parents, thanks to these laws, you could receive offspring with any combination of traits listed in the above table, even if the parents looked the same. Polymerase – An enzyme used to bind monomers into polymers, or smaller molecules into large ones. Mutation – When DNA polymerase makes a mistake, and places the wrong nucleic acid in a DNA chain. Genotype – The alleles present at a specific locus in the DNA, which give rise to phenotypes through the production (or lack of production) of protein. Phenotype – The physical manifestation of the DNA, expressed in terms of protein. 1. Red hair is a recessive trait. Both of your parents have red hair. You have brown hair, a dominant trait. You begin to suspect that you are adopted. Is it more likely that you are adopted or that your hair mutated. A is correct. Both of your parents have recessive phenotypes, meaning they have recessive genotypes, too. Let’s call their genotype “bb”. This means that there were 4 alleles for hair color present. Of these, none would produce brown hair, in any combination. A mutation could cause a non-functioning allele to become a functioning allele, but mutations are incredibly rare. In fact, due to the random nature of mutations and the fact that there are 4 nucleic acid bases to choose from means there are 3:1 odds that the mutation will be the incorrect amino acid to make the allele function. 2. Mendel, when breeding pea plants, noticed that when he would cross a tall plant and a short plant he would not get a medium plant as he expected. Instead, he would get some short plants, and some tall plants. Why is this? A. Height is controlled by a gene, of which there are two alleles: tall and short. B. Some plants were shadowing the others, not allowing them to get sunlight. C. Medium plants are selected against by natural selection. A is correct. It turns out, the height of pea plants is severely impacted by the effects of a single protein. When the allele for this gene is non-functioning, the plants are short. However, a single functioning allele will produce tall plants. No medium plant can be created by a mutation in that protein, because a little bit of it can supply the entire plant with enough enzyme. 3. A pregnant mother gets skin cancer. The cancer forms a tumor, but has not metastasized, or traveled throughout the body, yet. Her baby is born. Does the baby have risk of inheriting the mutations that caused the cancer? C is correct. The probability that the baby will inherit the cancer is entirely dependent upon when the woman inherited the cancer-causing allele. The skin tends to mutate a lot, being exposed to the sun’s harmful rays. Most likely, the cancer causing allele was present only after a mutation was caused in the woman’s arm. The rest of her cells, including her egg cells, do not naturally carry the mutation. However, some alleles and certain genes are more prone to mutating than others. If the woman had an allele that was prone to mutation before the sun, she is probably passing it on to her child. In this case, the child would be likely to develop similar cancers when exposed to similar mutagens.